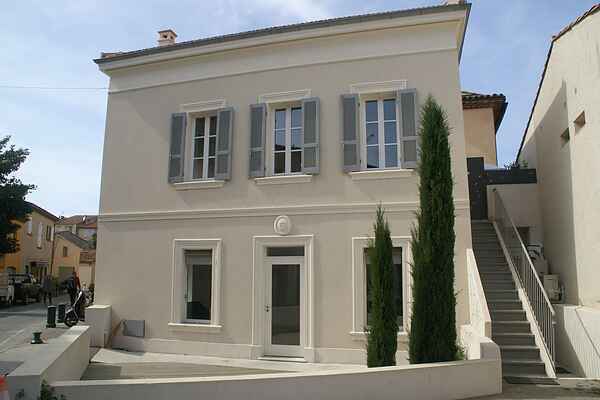 Beautiful, overwhelming town house between Place des Lices and the boulevard of Saint-Tropez. It's almost impossible to be anymore central in Saint-Tropez than this! By walking up the outdoor stairs (on the ground level there's a little boutique) you reach the entry way and terrace with garden furniture of this beautifully renovated home. It's just a matter of minutes to walk to the famous 'Place des Lices' to play a game of jeu-de-boules among celebrities and stroll through the picturesque streets to the pleasant boulevard. This boulevard is where it all happens. Enormous yachts, a train of Maseraties and Ferraris and whole lot of beautiful people. After this spectacle it's time for a bite on one of the trendy terraces or in one of the better restaurans (hiddin on one of the roads behind the boulevard) and then afterwards start your night in one of the luxurious clubs (the most famous one is 'Les Caves du Roy'). The next day you can take a walk to the cosy market (Tuesday and Saturday). In the afternoon you leave for the long, white, sandy beach of 'Plage de Pampelonne' (5 km) near Ramatuelle (11 km) where you can choose between the public beach or renting a lounge chair at a fancy beach club (for example Club 55).